You might remember Godzilla demolishing San Francisco’s Golden Gate Bridge, or Matthew Broderick defeating the monster in New York, but what do you know about Godzilla’s nuclear past? The original Godzilla film tackles the threat of the atomic age and nuclear weapons, it’s about Japan being drawn into war again, and about people living with the constant threat of bombs and destruction. Godzilla, or Gojira, was one of the first films to show the full extent of the devastation that Japanese civilians experienced when the United States dropped bombs on Hiroshima and Nagasaki at the end of World War II. 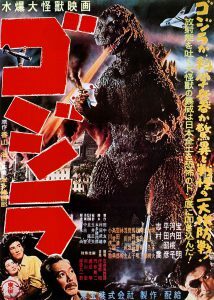 30 Godzilla films have been produced since Ishirō Honda’s 1954 Japanese science-fiction original. In that time, the monster’s story has morphed from a nuclear allegory into a Hollywood cliché – but recent events show that our fear of nuclear catastrophes is far from over. Wikipedia searches for ‘Godzilla’ spiked following the 2011 Fukushima Daiichi nuclear disaster, showing that the monster’s power as a window into post-war attitudes about the dangers of nuclear radiation still rings true today. Dr Jason Christopher Jones of Monash's Japanese Studies program has been interested in Japan since he was a child. His inspiration? Video games. In his youth, everything was text based, and in order to know what was happening in the game, he had to learn to read it in Japanese. Dr Jones recently spoke to us about how the Godzilla films reflect Japan’s experience of nuclear tragedies, just one of his particular areas of research. Jason joined Monash University in 2015. He is a lecturer in Japanese Studies in the School of Languages, Literatures, Cultures and Linguistics, and researches wine manga, Godzilla and themes of cultural exchange and adaptation. In addition to his research, he is an active translator and interpreter.